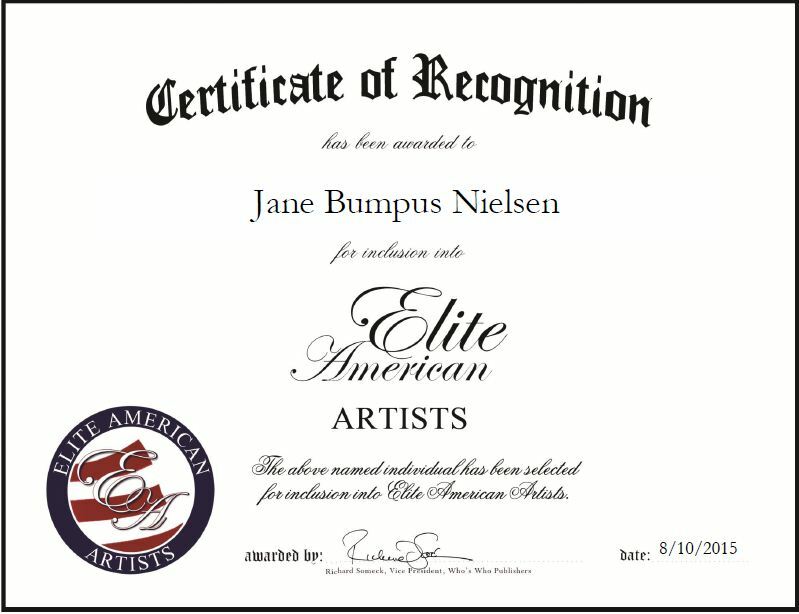 Marblehead, MA, August 10, 2015, Jane Bumpus Nielsen, Executive Director of Helen Bumpus Gallery, has been recognized by Elite American Artists, for dedication, achievement and leadership in fine arts. Ms. Nielsen has 13 years of professional experience, with six years as an executive director of Helen Bumpus Gallery, where she specializes in art gallery administration, energy placement and garden design. Each day, she handles all exhibition press releases for artists, and she also installs and dismantles exhibits as needed. Ms. Nielsen moderates all board meetings and reaches out to new artists, while also overseeing all gallery activity and creating material for website design installers. Looking back, Ms. Nielsen attributes her success to her hard work and dedication in her studies, and endeavors and being around her two daughters and four grandchildren. She became involved in her profession because of her grandmothers gallery and her love of art. She became involved in Feng Shui, because she wanted to learn more about how the energy around her affected her everyday life. She became a garden designer, because of her love for gardening and energy placement. She became an author, because of her love for books and a need to tell her story of the incredible journey she took to heal and find wholeness and meaning in her life. The one highlight of her career was the day her book “Journey Through the Garden” was published and arrived at her door. In five years, Ms. Nielsen hopes to grow the brand of Helen Bumpus Gallery and write another book with her grandson. This entry was posted in Art Gallery and tagged author, energy placement, fine arts, garden design, press releases, website design. Bookmark the permalink.